Do you love to spin, but can’t seem to find the time to make it to the gym? Ever consider getting a spin bike for yourself? Think about all the benefits of having an indoor bike to yourself! You save money on a gym membership and transportation costs and exercising becomes convenient when it’s right in your home. I’ve compiled for you a list of the top 10 best indoor bikes available on the market today to make your search easy. Although there are many things to consider when buying the best indoor bike for home, it doesn’t have to be a drag! 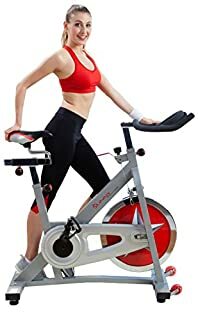 I’ve done the research for you and compiled a list of Best Spin Bikes of 2019 for your review. Keep in mind what kind of exercise you plan to get as well as your height, weight, and key features that might be deal breakers for you as you peruse the list. So, what is a Spin Bike or Indoor Cycling Bike anyways? Spin bikes are a type of exercise bike. They have a weighted flywheel directly linked to the pedals. Spin bikes are unique in that they are fixed-gear. This means that when you stop pedaling, the pedals will continue to spin due to the inertia of the flywheel. This inertia allows for more revolutions of the crank per minute, otherwise known as cadence. They’re fairly simple bikes with not too many bells and whistles making them low-maintenance and easy to fix. Indoor cycles are designed like road bikes which means you’ll get a similar workout as if you’re riding a real bike. Speaking of, let’s get into the benefits of indoor cycling and using a indoor bike. Indoor cycling has been well-loved by many. With the rise in popularity of spin classes, people are enjoying the benefits of getting a good workout on an indoor bike. As a given, indoor cycling is a way to get your heart rate up which helps lower the risk of many diseases and health ailments. Continuous cardio keeps your heart healthy and lowers your risk of coronary artery disease as well as lowers your blood pressure. Exercising regularly helps to reduce stress, making you more productive in the workplace. It also increases happiness and who doesn’t want that? Less stress also benefits your immune system. Spinning increases the endurance of the muscles in your legs. This helps to strengthen your bones, tendons, and ligaments that surround those key muscles. Spin bikes are designed similar to road bikes, so you must use your core and arms to stabilize yourself over the bike. This means added strength to your upper body as well. Lastly, as good of a workout as cycling is, it remains a low-impact activity. This means less stress on the sensitive points on your body like the joints in your ankles and hips. This is why many people prefer cycling to high-impact activities like running. Now that you know that indoor cycling bikes can be endlessly beneficial to your health and well-being, you’re excited to look into one, am I right? But exercise bikes need to be made ergonomically sound for users to reap the benefits we spoke about. This is what sports equipment companies are good for. I look at a few of the top brands below. Keiser Corporation was founded by brothers Dennis and Randy Keiser in 1976. They are known for making some of the best indoor bikes on the market due to their intelligent resistance technology. They created the first air-powered variable resistance exercise machines. Keiser has taken part in many research studies on the effects of strength training on aging. Their equipment is made with results from research to back up their claims. Olympians, major baseball teams, even Navy Seals, use Keiser’s training equipment. If these pro athletes rely on Keiser for achieving their health goals, you can only expect greatness for yourself as well. Bladez is a company that produces quality indoor fitness equipment. They’re a division of Beistegui Hermanas Global Group headquartered in Spain. Bladez’ consumer base is wide-ranging. They have distribution centers in Asia, UK, Germany, Spain, North America, Mexico, and Portugal. They’ve also been around for over 100 years. Their long history attests to how great their products are. A well-trusted and widely-used fitness brand, don’t be surprised if you see their equipment at your local gym, or at your friend’s house. Although they are fairly younger than the aforementioned Bladez Fitness Company, Sunny Health and Fitness has not wasted their time in their 10 years in the fitness industry. Headquartered in LA, Sunny Health and Fitness has their manufacturers based in Taiwan and China. This allows them to be more competitive than other fitness brands based on price. If you’re looking for a bargain bike that is still of top-quality, look no further than this company. They’ve also been known to have excellent customer service. In the case of defective parts, shipping issues, or help with assembly, a customer service representative will be there to help any need. BodyCraft has been around for over 70 years making quality fitness equipment for the avid fitness enthusiast. They think holistically when crafting their equipment- about the user, maintenance, and durability. They invest strongly in the safety of the equipment as well. They also care that the equipment can be used for various purposes in helping users achieve their fitness goals. The designs of their equipment are user-friendly and aesthetically pleasing. They manage all of these key factors while keeping their models affordable. With a BodyCraft bike, you can rest easy that it’ll be built to last. Biking outdoors is a great way to pass the time with your family and friends. 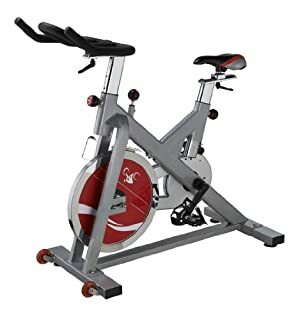 But if you’re a fitness buff with limited time who wants to achieve fast results, a spin bike for home could be a great option for you. 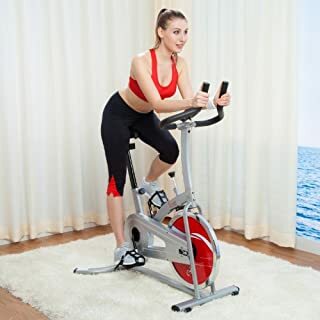 Below is the list of the top models of the indoor spin bikes available on the market today, which can help you to choose the one that’s best for you. Sunny Health and Fitness crafted the SF-B901 Pro Indoor Cycling Bike at an impressive and inexpensive price point. For the low price, you get a lot of quality out of one of the best indoor cycles. Let’s start with the ride. A 40lb. flywheel mimics the momentum of a real road-bike making for an effective workout. Smooth-drive mechanism keeps the pedals from sticking while you turn. It is all held together with a sturdy steel frame. You won’t experience any rocking of the bike even at intense speeds or standing up to cycle. Speaking of speeds, you’ll be able to control how tough your workout is with unlimited resistance levels. That’s right, this bike is not just for beginners. Avid, experienced riders will find that this bike offers plenty challenge to their workout. Although the resistance is not magnetic, this bike remains fairly quiet. You’ll be able to watch TV or listen to music without having to increase the volume. Handlebars and seat are adjustable horizontally. Although I wish they could be adjusted in fore/aft positions, many users will be able to find a comfortable position with what’s offered. This bike has a weight capacity of 275lbs, which is indicative of how well-built this bike is. Unfortunately, this model is missing a water bottle holder and console display. If you’re the type that needs data tracking to keep you motivated, I’d suggest buying a separate computer console and attaching it to the bike. The construction of this bike makes this model from Sunny a real steal when it comes to top spinning bikes. You’ll be able to put this bike together in under 30 minutes and begin riding to your heart’s content (literally). This bike gets our Editors Choice award for best indoor bike of 2019. Following closely behind the Sunny Health and Fitness model is Bladez’ Echelon GS Indoor Cycle. This bike has many of the features that the previous model was missing including adjustability, water bottle holder, and LCD console. Although they’ve included those extra features to our liking, they have not neglected the construction of the bike. It’s a bit on the bulkier side, but this makes for a sturdy oversized frame that keeps the bike stable. Forty-pound flywheel weight keeps your heart rate up and your legs working hard. Plenty of resistance levels offers a plethora of workout options. The fact that they are unmarked may turn some users off. For those who don’t mind, I’m sure you’ll find this easily adjustable. You may notice that the flywheel is not guarded; therefore, it will need to be wiped down after each workout if you find your sweat flying onto it. This will keep the equipment from corroding and wearing after short-term use. Both the seat and handlebars are adjustable horizontally and forward/backward so you can really find your sweet spot on the bike. I also like that this bike comes with short aero bars in the middle as well as the standard spinning handgrips. This gives you plenty of options for comfort. The LCD monitor displays your speed, time elapsed, distance and calories burned. A computer is not a feature often seen on a spinning bike in general and definitely not in this price range. Perhaps don’t expect the monitor to be the most accurate, but it’s great for keeping you motivated. Like the previous Sunny model, this bike’s resistance is handled with a felt brake pad so don’t expect complete silence as you ride. It will be quiet enough for most users. 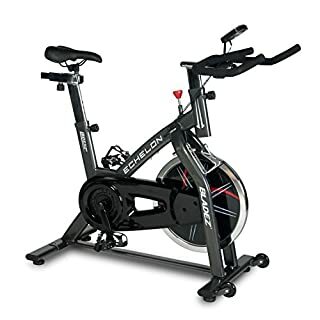 Overall, this is an excellent top rated indoor cycling bike from Bladez. It will help you stay motivated with the console. With the adjustability options, you can rest easy that this bike will fit you fine. Upwards of $1000, you can expect to get a well-designed high end spinning bike from BodyCraft. A heavier flywheel and practically silent magnetic resistance put this cycling bike at number three on our list for a good reason. Let’s talk flywheel. At 46lbs, a bit heavier than previous models mentioned, you get more inertia, more road-bike feel, and a more well-balanced ride. This flywheel is special in that it uses an SKF sealed bearing. This keeps the wheel turning in a natural, smooth riding motion. Magnetic resistance makes this the quietest kind of stationary bike you could have in your home. It’s whisper quiet- you’ll probably be breathing louder than this bike is spinning! Like the Bladez model, the flywheel is not guarded against sweat and debris. Have a towel and disinfectant spray handy for the end of your workout. Resistance levels, though unmarked, are smooth and continuous. Changing from one resistance to the next is a cinch. It’s within easy reach so you can change resistance while riding. The seat and handlebars adjust both horizontally and vertically so you can find your perfect fit. Many will also find the seat fairly comfortable which is not usual for cycling bikes. Riders upwards of 6ft will feel comfortable using this bike. This bike boasts not one, but two water bottle holders so you won’t have to worry about being parched as you work out. Transport wheels make this an easily transportable bike. Two coatings of paint cover the steel frame of the bike making for a clean, long-lasting finish. The only thing this bike is really missing is the tracking console. Otherwise, this is a solid bike that many people can’t go wrong with. Bladez brings us another killer cycle with their Fusion GS II. This heavy-weight bike stays sturdy even at your highest speeds. Many features on this bike make it a great buy for its’ competitive price point. One of the first things I noticed and enjoyed about this bike is its’ space-saving quality. Its footprint is small compared to other bikes, and transportation wheels make it easy to move from one room to another. It’s not a bad looking bike either if you want to leave it to show off to friends. The assembly on this bike is easy- you’ll be able to put it together independently within an hour. It is constructed with a strong steel frame, 40 lb. flywheel, dipped racing style handlebars, and anatomically designed sports seat. The bike is able to hold a weight capacity of up to 275lbs while remaining quiet and smooth with the flywheel. 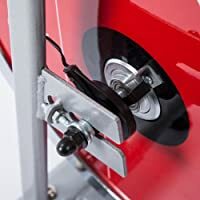 Unlimited levels of resistance are manually adjusted using the tension knob. The pedals even come with baskets to keep your feet in place. The seat and handlebars are fully adjustable, both fore/aft and up/down. You know I love this feature on any bike. Max user height has been known to reach users up to 6’2 to as low as 5ft. All of these features and I still haven’t even mentioned the LCD console yet! Although it’s not super high-tech like some bikes have, it’s more than enough to keep you on track. You’ll be able to see your time, distance, speed, calories, and scan. 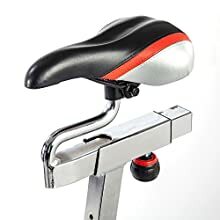 Although Bladez Fitness claims the bike seat is “anatomically designed”, many users may still find the seat uncomfortable. Also, the specially designed handlebars can sometimes be wobbly if not screwed on correctly. 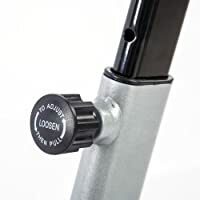 These are two problems easily fixed as seats are easily replaceable or covered with gel, and screws are easily tightened. An overall winner from Bladez Fitness, you’ll be riding the day away on this bike. With a Keiser model, you can expect it to be on the pricier side, but that’s a good indicator of quality. And boy, does Keiser make some quality products! The M3i Indoor cycle is no exception. The sleek design and high-quality build of this bike will make it a welcome addition to any home. Resistance is magnetic. So, yes, you can expect a “whisper quiet” ride as Keiser likes to call it. Many users will be surprised at how quiet the equipment is while in use. You get a total of 24 levels of magnetic resistance making this bike versatile for both beginners and experienced riders. High-speed racer? No problem. The study steel frame will keep you planted firmly to the ground. Seat and handlebars are fully adjustable every which way you could please. Caged pedals keep your feet in place. A water bottle holder holds your much-needed hydration. Keiser also inputs a backlit LCD display to track RPM, elapsed time, HR, watts, gear, and TRIP/ODO distance. It also has Bluetooth capability meant to help you track your data on commonly used smartphone fitness apps. This feature seems to be lacking in capability, though, so I wouldn’t count on it. This bike also comes with a media holder, which snaps onto the handlebars. Set your tablet, Kindle, or phone there for easy access. This is a feature that hasn’t been offered on any of the previous models mentioned so far. Such a high-quality piece of equipment ends up having a fairly easy assembly, but unlike other models, you’ll have to have a few tools handy. Expect to spend up to an hour building this bike, with a tool-handy friend ideally. If your wallet can handle it, I think this is a great choice for an at home indoor bike. Think of it as an investment where little maintenance will be needed and a lifetime of use should be expected. Another high-quality spin bike option comes from Keiser again. This time, it’s the M3 Indoor Cycle. Differences from this bike to the previous M3i Model include handlebar adjustment and lack of certain added extras. It remains the same with regards to durability and quality build. This bike is powered with magnetic resistance so it will be as quiet a ride as you can get with an indoor bike. The frame is made of corrosion resistant steel making this bike durable and long-lasting. The M3 offers the same number of resistance levels as the M3i, so you’ll be able to be as challenged as you’d like. You can purchase this bike in either black or platinum options, both sleek in design and eye-catching. This bike is also easily assembled- yes, easier than the aforementioned M3i. Don’t worry about having your own tools. One significant difference between the M3 and the M3i is the handlebar adjustment. The handlebars on the M3 can only be adjusted up or down. Word of caution: adjusting the handlebars up will cause them also to move forward and vice versa. This has resulted in a few complaints among shorter consumers because the handlebars don’t reach low enough. Those at the taller and shorter ranges of the spectrum may rest easier with a bike like the M3i as it allows for maximum adjustability. The M3 shouldn’t be a problem for average height users but is definitely something to keep in mind. 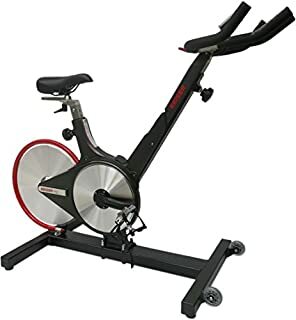 If you’re looking for a basic spin bike that is reliable and gets the job done, I think you’ll enjoy this model from Sunny Health and Fitness. Sunny Health and Fitness SF-B1110 is easily assembled as well as easily adjustable. It is made with a heavy-duty crank and steel frame for durability. The weight of the 44lb flywheel keeps the bike stable. A chain drive mechanism is used to add resistance. For this reason, it’s not as quiet as those magnetic resistance bikes we like. It is still a quiet bike that you’ll be able to ride without bothering your sleeping roommates. The manual resistance knob is known to be rather sensitive. A small turn of the knob will add or decrease resistance. With repeated use, resistance levels should become intuitive. The handlebars adjust fore/aft while the seat is adjustable both fore/aft and up/down. Users have not found too many issues with adjustability, but it is important to note that tall users over 6 feet may have a hard time fitting this bike. Caged pedals keep your feet in place, and transportation wheels make this easy to store away when you’re finished. It’s missing a computer, but for a basic model such as this, that’s not really a surprise. Beginners and moderate trainers will find this bike has everything they could need for their health goals at an affordable price. Looking for something more high-end but still simple? The 98623 Revolution Cycle Pro II Indoor Cycling Trainer may be just what you’re looking for. The biomechanics on this bike are great, beginning with the efficient design and direct-drive resistance system. A 40lb. flywheel weighs the bike down firmly so that you can pedal to your heart’s content. Unlike other models, this bike is made ergonomically so you can pedal both forward and backward. A great feature on this bike is the quick-stop handle brake system. It allows you to pull the brake pads when you need to stop spinning without risk of injury. This is one of the safest indoor bikes you could get, ideal if you have kids running around the home! The bike weighs a total of 113lbs and with transport wheels, you’ll be able to easily store this bike away. But, like I mentioned earlier, this bike is of a sleeker design so you may not even want to roll it away. It’s a well-designed and aesthetically pleasing piece of equipment. This bike also wins in adjustability- seats and handlebars adjust fore/aft and up/down for your comfort. The only thing that’s missing is a console, but that’s a minor issue for those of us who don’t need it. For a pretty penny, this exercise bike with its’ special features and nice design could be a welcome addition to any home. 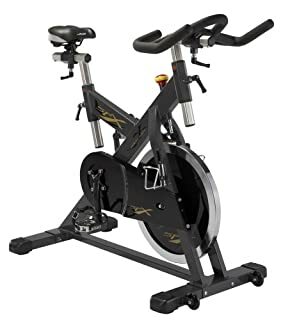 Similar to the SF-B1110, the indoor cycle trainer is a lighter version with a number of features missing from the previous model. A 22lb flywheel makes this bike the lightest in the entire list. The chain drive mechanism works with the flywheel to add resistance whether you’re looking for a challenging or moderate work out. The same crank and steel frame make up the supportive base of the bike. It is able to hold up to 220lbs. Front rollers on the bike make this a space saver as well. The seat height is adjustable up and down, but not much more than that. Since this is a lighter model, this bike is ideal for shorter users under the height of 5’10. One additional feature is the LCD console display. You’ll be able to track your speed, distance, scan, time, and calories while you work out. I know this is a big plus for some of you. Some users may find that their bikes come with defective parts. You may want to deal with a local retailer to avoid these issues. This is another basic bike without too many bells and whistles but with just the right features to make this a great spin bike to own at home. The affordable price doesn’t hurt either. 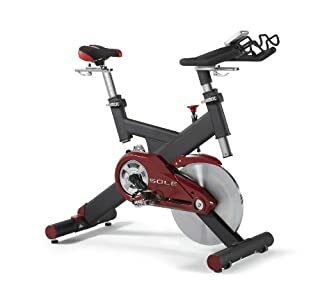 Lastly, Sole Fitness SB700 spin bike comes to us with a high-end heavy duty bike with great capability and sturdy build. It holds up to a max user weight of 300lbs and comes with plenty of features. This bike is made with the best-quality materials and with a fantastic sleek design, yet is easy to assemble within an hour. The 48lb flywheel weighs the bike well. This bike is also compatible with chest straps for heart rate monitoring. Although not included with the bike, this is a handy feature that not many other spin cycles offer. The backlit LCD console with large easy-to-read digits also allows you to track those other important numbers. The resistance knob is sensitive to touch so heavy-handed people be weary. Plenty of resistance levels are provided for every type of rider. You’ll be able to find your perfect fit as both seat and handlebars move horizontally and vertically. For the high price, you’d expect a good warranty, and Sole Fitness did not let us down. Lifetime warranty on the frame, three years for parts & electric, and one year for labor. It’s one of the best warranties you could get on exercise equipment. A water bottle holder is the last feature that finishes this bike. 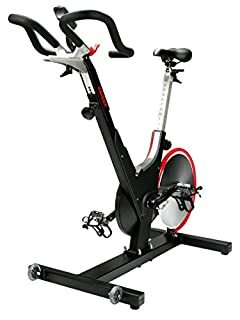 It’s a great spin bike, and yes at a pretty hefty price. But, as they say, you get what you pay for. You’re probably a pro by now, but what key things should you be looking for when investing in such an important piece of equipment? Frame. The frame holds the entire bike together. It acts as the supportive base of the bike. The frame material should be strong and durable. Steel is commonly used as the base frame of most cycling bikes as it doesn’t corrode easily and lasts a long time. It is also fairly heavy. The heavier the bike, the more stable it will be when you decide to ride at those high speeds. Adjustability. This is probably the most important thing to consider in terms of personal use and customization. Having both handlebars and a seat that is fully adjustable will give you the most freedom in finding the best fit for you. Experienced riders know that finding a perfect biking position can work wonders for your riding experience. Resistance System and Resistance Levels. The two best ways to add resistance to an exercise bike are friction resistance and magnetic resistance. Friction resistance utilizes a felt pad pressed against the flywheel to increase or decrease resistance. Magnetic resistance implements two magnets on either side of the flywheel. Both are able to be ridden while your partners are sleeping away, although magnetic resistance produces the least sound. Resistance levels on indoor bikes may vary. Many come with the standard 8 levels, other high-end bikes come with up to 24 levels. Warranty. Most products of such a high investment do a good job of providing a decent warranty. Look at warranty for the frame, for labor, and for electric/technical issues. Other considerations. Some other things to consider would be additional features. A media dock is nice if you like somewhere to put your handheld devices. Water bottle holder makes it convenient to reach for a drink while spinning. An LCD monitor with data tracking can be great to keep you motivated. All of these are considered extras and not necessary to get a good spin workout, but often, these extras become motivators. To really get to know spinning and appreciate it you need to up your performance so you can explore all the benefits it has to offer. The right gear prevents injuries, improves performance, and mentally prepares you to get on your bike. Sole: one of the benefits of a spinning shoe is its stiff sole. The stiffness of the sole allows the energy you use pushing to be put right into the bike and not lost in the shoe as it softens over the pedal. It creates a firm surface for you to stand on for jumps and standing climbs. 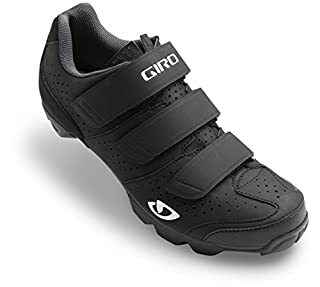 Cleat System: if you’re looking for a shoe that will accommodate most indoor spinning class bikes, you’ll want to look for the “SPD” (Shimano Pedal Design) system. 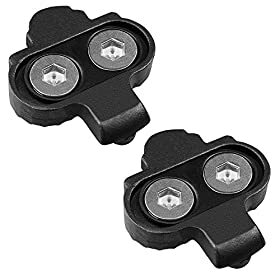 This uses two holes on the bottom of the cleat that attaches to the pedal. These are easier to walk in off of the bike because the cleats are recessed. The other system, the “Delta” system, uses three holes to attach to the pedal. This system is non-recessed meaning your cleats will stick out of the bottom of the shoe and will likely give you a tough time walking. Closure: don’t get fooled into buying a fancy closure system on your shoes. Velcro will work best and is easy to take on and off. If you want something fancier, you can try a ratchet system, Boa system, or old-school laces. Upper material: if you care more about comfort, then choose something that is breathable. Your feet will sweat during class, so you want something that will promote airflow and limit moisture development. If you want to pay for a style upgrade, then go with an Italian leather upper. It may seem trivial but wearing the right sports bra can make all the difference for indoor biking. You should choose something with medium support and lots of coverage as you’ll be bent forward for much of class. A moisture wicking sports bra will help keep you dry and comfortable during class. If you have a smaller bust size, a sports bra with some compression will help to prevent movement by holding your breasts against your body. If you have a larger bust, you may want a sports bra that encapsulates. These molded, supportive cups will help prevent painful bouncing without the use of compression that can be uncomfortable for a larger bust. You may decide you want a jersey for the class as an outer layer. These can be costly but do an excellent job of wicking moisture to help keep you dry. Look for something that fits snugly but isn’t so tight that it causes chafing. This is another item that can make a world of difference in your spinning class. Padded shorts add extra cushion to keep your sit bones and saddle area from taking the brunt of the weight. This helps to prevent soreness in your saddle region, making it much more likely you’re going to keep attending class every week. 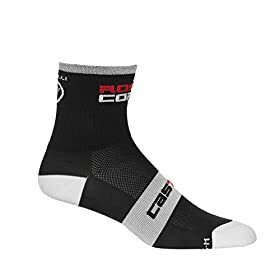 Socks: just like the upper in your shoes, you want to find socks that will keep your feet as dry as possible. You’re going to be working up a sweat in class so finding a sock that will wick away moisture will keep you more comfortable. Another key to indoor biking socks is a reinforced toe and heel. 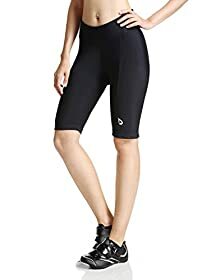 These areas tend to get the most wear and tear during cycling, so you want something that will not only last but also keeps you from rubbing your skin raw. Sweatband: if you find that you are constantly pausing your workout to wipe your face or hate the taste of salty sweat dripping into your mouth, you may want to think about a sweatband. It will keep your focus on your workout instead of searching for your towel. 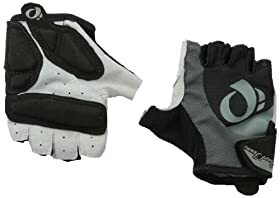 Gloves: similar to the sweatband, if you’re wrapping towels around your handlebars to keep your hands from slipping off, then gloves might be a good solution. Gloves will give you a better grip on the handlebars, making transitions from sitting to standing easier and more stable. They can also help prevent callouses or chafing from gripping the bar. Heart Rate Monitor: this is an important item that is often overlooked. Having your own personal heart rate monitor gives you a reliable source of information about your fitness level and can help you set goals and track progress. With a heart rate monitor you can monitor how much time is spent in high-intensity exercise and how quickly your heart rate recovers from intense bouts of high resistance strokes. A heart rate that quickly returns to baseline is a sign of good fitness. You may think, do I really need to bring a gel seat cover to class? Isn’t there already a cushioned seat on the bike? While many indoor bikes will offer a small amount of cushion, it’s usually not enough padding. 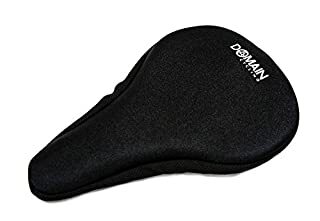 If your spin bike seat hurts your saddle region after an intense workout, you should look at adding a gel seat cover to your gear inventory. Stationary bike seat cushions come in many different shapes and sizes, but the gel is a great way to go for off-loading your sit bones. It can also be a cheaper solution than buying multiple pairs of padded shorts. Learning how to make your spin bike seat more comfortable will keep you coming back to class week after week and pushing yourself harder during workouts without fear of saddle soreness afterward. While spinning classes are a great way to get into indoor biking without purchasing your own equipment, you may be someone that doesn’t like the group setting or would rather save the money spent on classes. Or maybe you want an extra supplement to your spinning classes. If you’ve got an indoor bike set up at home, you’ll want to find a good collection of workout DVDs and YouTube videos to keep you motivated. Look for videos that not only push you, but also offer ways to adapt the workout and focus on the techniques and positions. This will help to prevent injuries and ensure you’re using the right body mechanics that an in-person instructor can easily spot and correct. So, there you have it. 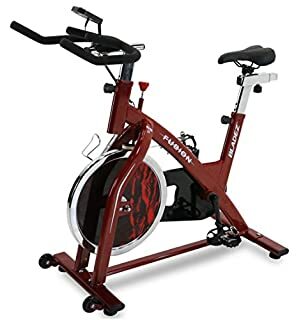 The list of the Best Indoor Bikes 2019 to help you find your best spin bike. Bring the convenience of the gym to your home and never have an excuse to not work out again. Spin bikes don’t have to take up ample space in your home either. New updated technology and design have made spin bikes welcome additions to the home without taking up space. Don’t you just love research and growth? It’s time to grow your fitness goals as well, and an indoor bike can help you get there. So what are you waiting for? Time to get spinning on your new bike!